When Things Don’t Go Your Way and You end up With Organic Grass Fed Chicken Breast at the End of the Day! 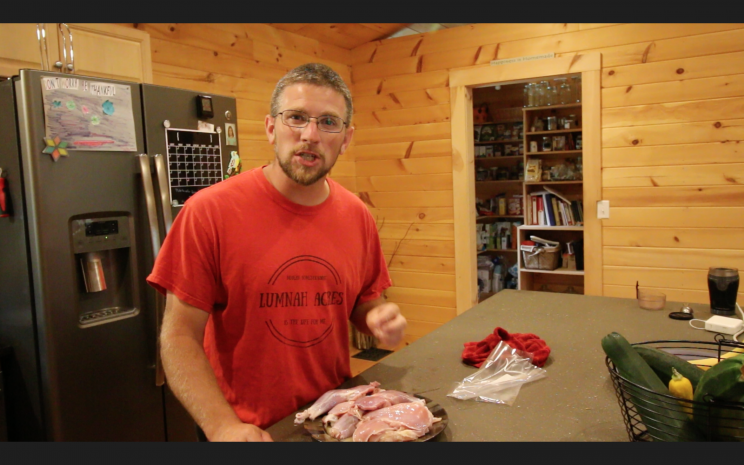 I didn’t plan on butchering two of our pasture raised organically fed meat birds today. But it has been on our to do list lately. We have been so busy building our Off Grid Outdoor kitchen (I am going to link that video series here ), that a few things have been neglected. Harvesting the two remaining roosters being one of them. One of the reasons we needed to do this is so we could divide up the new meat bird chicks that we got from Cackle Hatchery in the frying pan special. We got fifty of them. When they were chicks it was fine to have that many in one of our chicken tractors. Now that they are growing they need more room and we need to separate them into two chicken tractors. And the two roosters were in the other one. I moved the chicks into a crate and brought them over to the other chicken tractor. 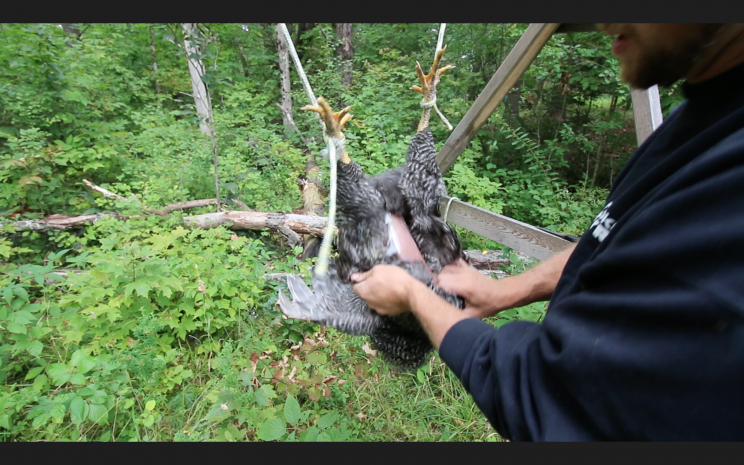 Here is the link to the video of us moving the birds. It was time to let the chicks out of the crate. They were reluctant to come out! After I was able to get them to come out. 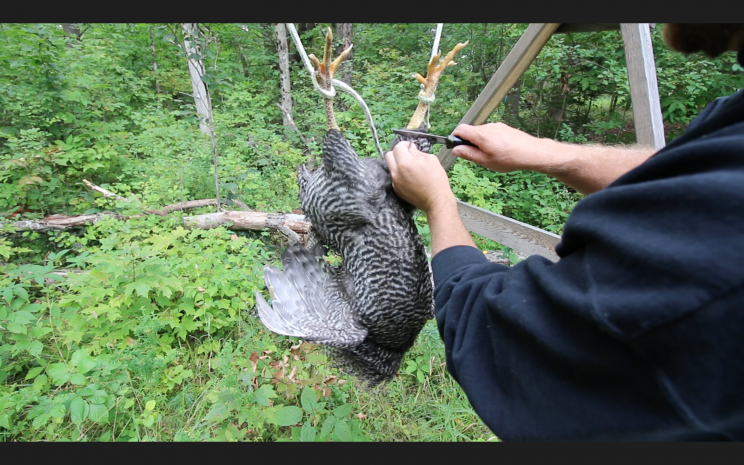 The Barred Rock roosters (around 16 weeks old) started picking on the meat birds pretty aggressively! At this point, I started thinking about how our Icelandic chick-Blackie was attacked by our broody hen! I did not want to come home to a site like that! So I decided I was gonna have to move the silkie hen back into New Yolk City and keep the Barred Rock Roosters in the crate and when I got home from work I was gonna have to process them. Now only having two roosters to process I didn’t want to set up our scalder, get the water up to temperature and get out the plucker. That seemed like a lot of wasted energy. I had never skinned a chicken like you would a rabbit or other game. But I decided that today was gonna be the day to try it. When I got home from work, I set up a quick harvest station. 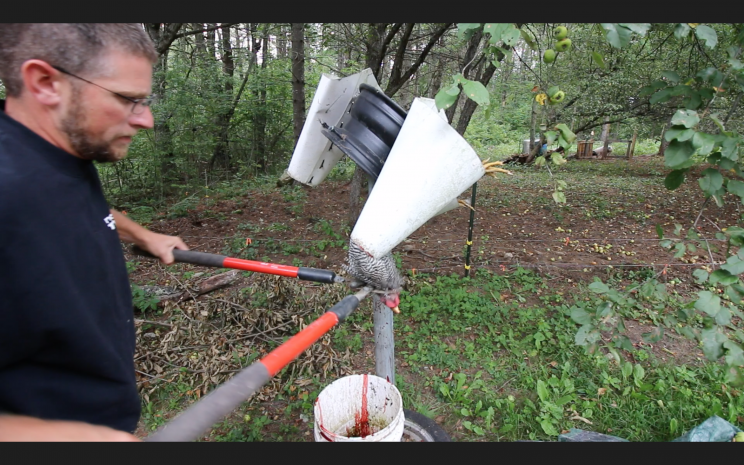 I have a stand with harvesting cones, which you put the chicken in and bleed them out in. Then I moved the chicken over to the station that I made which you can hang the chicken upside down from their legs and remove their feathers and skin pretty easily. While I was removing the skin I cut the wings off, which makes it easier for the skin to come off. Being a heritage breed there is not much meat on the wings. Once the skin is removed I cut the legs off at the joint. 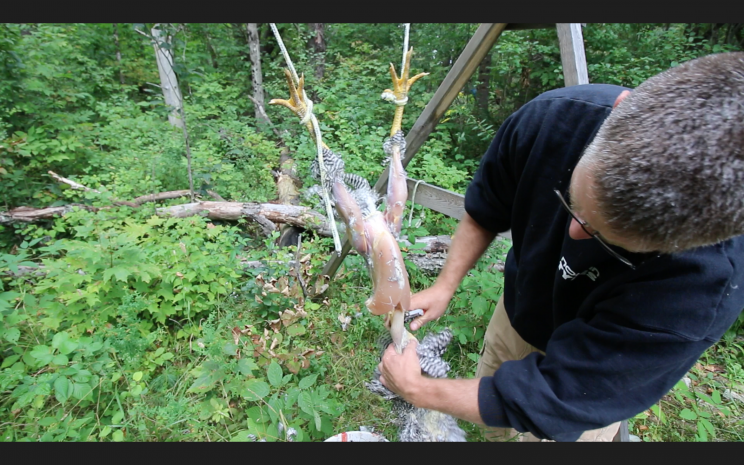 At this point, I moved the carcass over to our makeshift table. I should also state that I did not remove any of the guts from the chicken. I used a sharp boning knife from the kitchen, a filet knife would work well too. 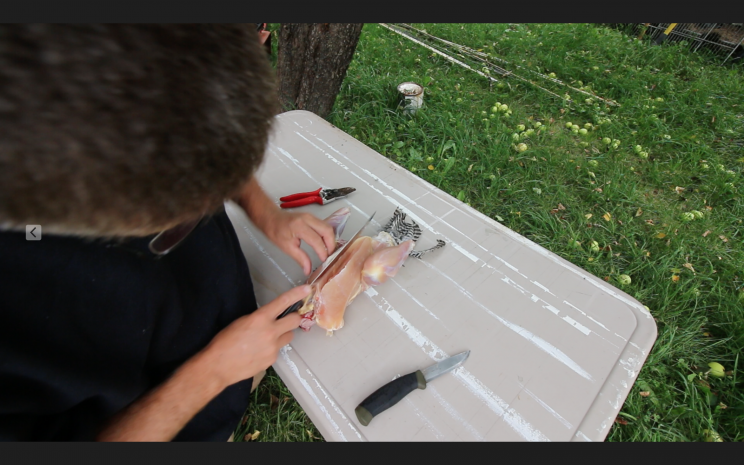 The Mora Knife that we use to bleed out the chickens is a little too thick to use when you are removing the breast meat off of the bone. Then I cut the chicken breast off of the bone, cut the meat that goes around the bottom of the chicken leg and then I gave it a twist and the leg was free too. I brought the pieces of meat into the house let them sit in a small tote of water for a little while. After 5 minutes I rinsed the meat off, patted the chicken dried and put them in freezer bags. Now I am dreaming of making chicken marsala with the chicken breast (My lovely wife’s favorite dish)! My day didn’t go as I planned it. It ended up being a pretty busy day between moving the birds to new chicken tractors going to work and then harvesting to beautiful meat birds. I don’t think I can complain, we ended up with some beautiful organic fed pasture raised chicken in our freezer at the end of the day. 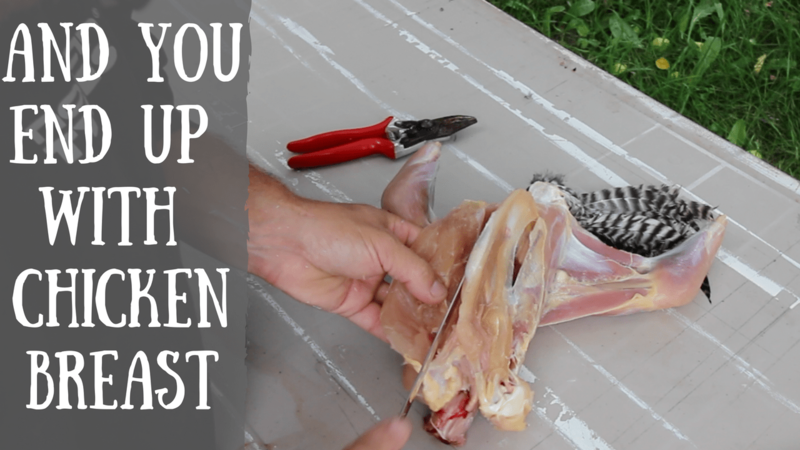 An excellent tip about being adaptable and a great overview of dealing with the meat birds and processing the roosters via skinning them versus the usual method. This made for both a great video and an excellent blog post. It has reminded me that I have been meaning to cook Chicken Marsala ever since you uploaded the video about it a couple of months ago. I’ve just dug through the archive and found that to re-watch, so that I can double-check what I need again! Thank you for another great post. Al – how long do you think you’re going to need to let Barred Rocks grow to get some meat on them? 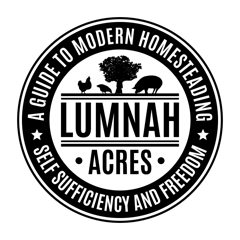 I really have enjoyed your “Modern Steading” My family and I are slowly working towards self sustainability. Your website and youtube channel have been guide and source of excellent information. I make a wonderful chicken soup in winter, Fideo con Pollo. super super easy to make. Brown chicken and saute onion, garlic, peppers. Once all that is done throw all together in one large pot with the carcass and water to 2″ above. Add Diced Tomatoes, cumin to taste, salt and pepper to taste (I like to add tomato bullion instead of salt). Bring to boil then lower temp cover and simmer till chicken is done. Remove bones placing chicken meat back in pot with soup. Add chopped cilantro and any other veg that you would like in soup and simmer till veg are done. when soup is boiling add smashed pasta cook till tender. Serve with grated cheese, sour cream, diced green onion on top. So So So yummy on those cold days, warms you to your toes!! I hope you try this recipe and enjoy it. Thank you again for all your wonderful work and time you put into your extremely informative videos. It’s a shame you don’t have a donate button! I’d most certainly donate to this outstanding blog! I suppose for now i’ll settle for bookmarking and adding your RSS feed to my Google account. I look forward to brand new updates and will talk about this website with my Facebook group. Talk soon! Do you have an instructional video on how you made your cones for the chicken harvesting? I thought I heard one day you had made them. I remember you said something about making an irregular diamond shape. I don’t remember seeing how you did it. What materials did you use? I don enjoy watching your videos. I do enjoy your videos.